Set your eyes on updated living at Timberlake Apartment Homes. 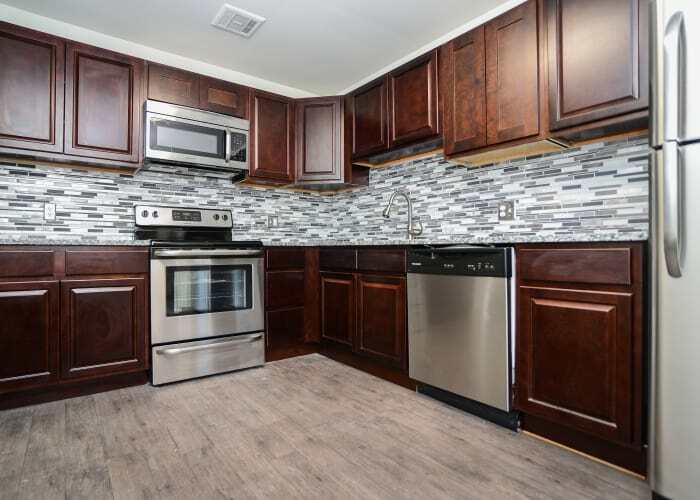 We offer beautiful one and two bedroom apartments for rent in East Norriton, PA. With distinct and spacious floor plans ranging from 846 – 1,289 sq. ft., you can choose your perfect layout. In addition to the generous square footage, each home boasts a range of convenient features. For your peace of mind, your new apartment will undergo the Morgan Properties 101-point inspection to ensure your home is ready for move-in. Embrace a life of relaxed sophistication at Timberlake Apartment Homes. Choose your favorite floor plan from our beautiful one and two bedroom East Norriton, PA, apartments. To help you live your best life and look the part, your new home features a full-size in-home washer and dryer. If you like to host your friends for dinner, take advantage of the chef-inspired kitchen, fully furnished with sleek stainless-steel appliances, granite countertops, and custom espresso wood cabinetry. After dinner, treat yourself to a glass of wine on your oversized, peaceful, and private balcony or patio overlooking the sprawling grounds. Experience the joy of updated living at Timberlake Apartment Homes. Call our leasing team today to set up a tour of your favorite floor plan.